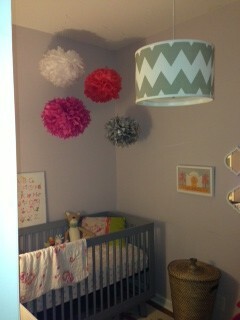 We changed our small playroom into a nursery for our second child-a girl. I wanted to create a welcoming bright space that maximized space with various storage solutions. I saw tissue pom poms used above the crib in other blogs/websites and thought that was a fantastic take on the classic mobile. My mom, who is a designer herself, always told me to find a statement piece that you love for a new room and use that as the inspiration for all else. For me, that was the Ikat rug. I loved the bright orange with fuschia color combination and incorporated those colors throughout the room. My style is eclectic - I like modern, vintage, and global and try to incorporate all of that in my spaces. I am definitely NOT afraid of color and mixing prints/patterns. I got the following items from Daytrip Society (http://www.daytripsociety.com/index.php?c=151) - three prints to the left of dresser; stone herringbone throw on Poang chair; Sea Bag on white lack book shelf in corner; and Deer stuff animal in crib (walnutanimalsociety.com). The crib is Babyletto Hudson crib which I bought on overstock.com. The lampshade is from House of Shades. The gray/white canvas storage bins in the storage unit are from Restoration Hardware. The curtain fabric is from Duralee Fabrics. The three white framed mirrors are from Target, as is the frame that the Mini Mouse print is in, the orange frame on the lack corner book case, and the table lamp on the storage unit. It is hard for me to choose. I love the rug and the tissue pom poms the best, I guess. I would say start with a statement piece - whether it be a rug; art work; wallpaper, or a piece of furniture. Get your inspiration from that and build the room around. Take your time to look around for interesting pieces - don't rush to buy everything at one place. Lovely and quirky room. I like that tall, slim shelf.